A portal where you can find thevoice and the music most suitable for your video project in an easy and intuitive way. With Milk Bricks you can create projects and playlists to organise your work, share it with your staff and contact us easily to receive our support straightaway. Milk Bricks is the perfect point of union between the production staff, the creative agency and the final customer. The portal is organised in two parallel sections: Voices and Music. 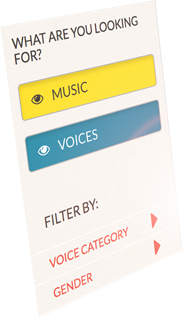 Each section has a filter which helps refine the search depending on the type of project, mood, vocal age, genre and much more. The upper bar is dedicated to free searches, and allows you to find what you’re looking for easily. Found something you liked, but you’re looking for an alternative? The function Find Similar does just that! In automatic mode, it will select all the music or voices that have a close relationship to your choice. In this way it’s easy to find what you’re looking for! 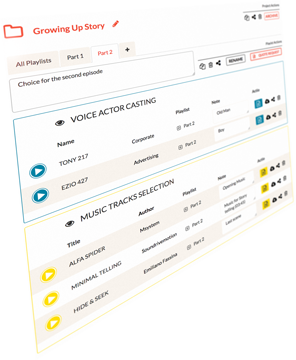 Your selections of music and voices can easily be arranged in projects where you can input records about the choices you’ve made. Within the projects, the selections of music and voices are always well ordered, thanks to being clearly divided by colour. And that’s not all! The playlist gives you even more help. The files you enter into each project can be organised into playlists. For example, you can divide your “Advertising campaign” project between “First Choice” and “Alternative” playlists or “Interior scene themes” and “Exterior scene themes”. Quick sharing is essential in audio/video production processes. 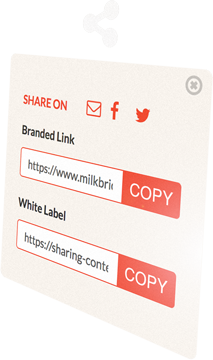 Milk Bricks offers a sharing tool designed for producers and agencies. You can find ‘Share‘ sbuttons for both individual files, and for projects and playlists. Wherever you are, you’ll always have two sharing options: Branded Link and White Label. The first is a simple sharing option that refers to our site. The second is designed for the benefit of agencies, offering a direct work tool. Each link will be entirely separate from our website, and have no reference to Milk. Music and Voices for your video project. Go to milkbricks.com and browse our catalogue.